Background: Acne vulgaris, a common human skin condition, is an inflammatory disease characterized by comedones, papules, nodules and possibly scarring. This study aimed to evaluate the efficacy of a combination of 5% dapsone gel plus oral isotretinoin in the treatment of acne vulgaris. Materials and Methods: A randomized, placebo-controlled, study was carried out on patients with moderate to severe acne. The patients were randomly divided in two groups: (dapsone gel and vehicle gel). All Patients were administered oral isotretinoin 20 mg daily and topical gel twice a day for 8 weeks. The Global Acne Assessment Score (GAAS), the number lesions and side-effects were documented at base line and weeks 4, 8 and 12. Results: A total of 58 patients (age range: 18-25 years) were included in our study. The number of lesions was significantly lower in the dapsone-treated group at all follow-up visits (P < 0.001). The mean GAAS score in the dapsone-treated group and in the Placebo-treated group decreased, but there was no statistical difference in two groups (P < 0.001). The side-effects on the dapsone-treated group were a mild burning sensation in 7 patients (24.13%), mild erythema of the skin and mild dryness in 4 (13.79%) and 3 (10.34%) cases respectively (P < 0.001). In our study, adverse effects were common but they were minor and tolerable. No clinically significant changes in laboratory parameters were observed (P < 0.001). 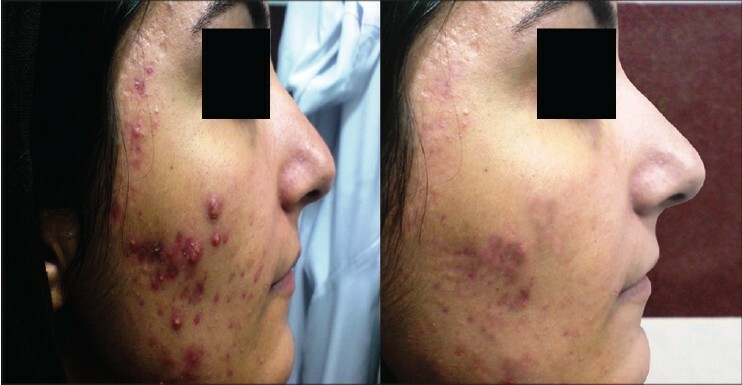 Conclusions: Dapsone gel was an effective medication for patients who received isotretinoin for acne vulgaris treatment resulting in a significant reduction of the number of lesions. Acne vulgaris is a common dermatologic disease that is usually managed by application of topical preparations, systemic medications, or a combination of the two. , Acne is primarily an inflammatory disease, challenging the current nomenclature of non-inflammatory versus inflammatory acne lesions, suggesting that the nomenclature is outdated and incorrect. The evidence in support of acne as an inflammatory disease also has clinical implications, in that anti-inflammatory drugs used to treat the disease can be expected to exert effects against all lesion stages, albeit via distinct mechanisms of anti-inflammation. Today, different topical therapies are available for patients with acne vulgaris, including comedolytic agents, anti-inflammatory medications, antibiotics, systemic retinoid and even herbal preparations. Antibiotics play a pivotal role in treatment. Dapsone (4, 4′-diaminodiphenylsulfone) is a drug of the sulfone class and was discovered in 1908. Oral dapsone has demonstrated efficacy in acne, but was associated with severe side-effects such as anemia, which was particularly serious in patients with glucose-6-phosphate dehydrogenase (G6PD) deficiency. Topical dapsone was developed to overcome this limitation. A unique property of dapsone is that it has dual therapeutic activity and demonstrates antimicrobial and anti-inflammatory properties. Dapsone 5% gel (Aczone) was developed to treat acne vulgaris and today has Food and Drug Administration (FDA) approval. There are a very limited number of studies on the topical use of anti-inflammatory agent in combination with other systemic medications such as isotretinoin in acne vulgaris. Due to a delay in starting of isotretinoin response, it will be helpful to add a topical anti-inflammatory agent to treatment regime to fasten the onset of clinical response and control initial exacerbation of symptoms. To the best of our knowledge, this is the first time to combine topical dapsone gel as an anti-inflammatory agent with oral isotretinoin in treatment of moderate to severe acne in order to enhance the efficacy. Hence this study aimed to evaluate the efficacy of 5% dapsone gel with systemic isotretinoin in facial acne vulgaris in Iranian patients. This double-blind, placebo-controlled clinical trial was conducted at Al-Zahra General Hospital, a referral clinic of dermatology in Isfahan, Iran. 58 young adults (age range: 18-25 years) with moderate to severe facial acne vulgaris according to the Global Acne Assessment Score (GAAS) were recruited from September 2012 through July 2013. Reasons for exclusion were: Acne being secondary to other problems; pregnancy or intention of pregnancy; breastfeeding; other dermatological diseases of the face; G6PD deficiency; taking any other acne treatment; history of having taken any medication that could interact with dapsone (e.g. Trimetoprim-sulfametoxazol) or isotretinoin (e.g. tetracyclines, methotrexate and vitamin A supplements) within the previous 3 months; and known hypersensitivity to the study medication. The patients were divided into groups randomly: (group A: 5% dapsone gel and group B vehicle neutral gel). The study protocol was approved by the Ethics Committee of Isfahan University of Medical Sciences, Isfahan, Iran (NO: 392090). All patients provided written informed consent before participation. All patients were administered oral isotretinoin (Roaccutane® , F. Hoffmann-La Roche Ltd.), 20 mg once a day for 8 weeks. The 5% dapsone gel was prepared in Isfahan University's Department of Pharmacy. Dapsone gel was prepared from its powder solved in a little ethanol and mixed with lubricant non-comedogenic gel up to 5% concentration. The dapsone gel and vehicle non-comedogenic neutral gel were filled in similar tubes that were marked 'A' or 'B,' indicating the side on which they should be applied. Topical 5% dapsone gel and non-comedogenic vehicle gel was applied on the face twice daily for 8 weeks in our patients (group A: 5% dapsone gel and group B vehicle gel). During the study period, only a caregiver who was not involved in the experiment was aware of the contents of the tubes; the patients and the examiner were blind to the topical compounds. The patients came for follow-up examinations on day 2 and weeks 4, 8 and 12. Photographic imaging was performed using a camera (Canon power shot G12, Cannon components Inc. Japan) in the same physical condition, by one person at base line and on each follow-up visit. The numbers of acne lesions were counted manually by the investigator for both the treatment site and control site at baseline and on each follow-up visit. The counting was assessed by marking each counted lesion with a pen to ensure that each lesion was only registered once. 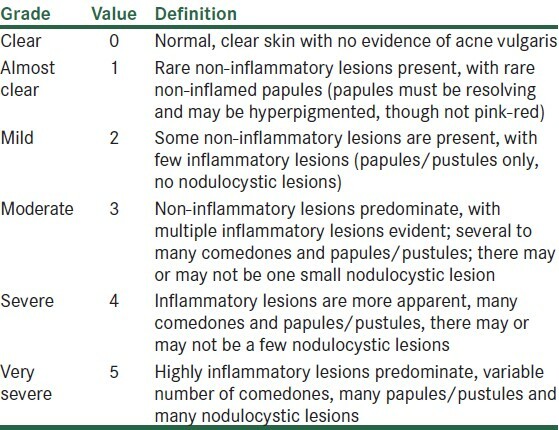 The global severity of acne was assessed by the investigator using the 5-point scale at base line and the end of the study  [Table 1]. All patients completed the study period. Presence of any possible complications/side effects was assessed and documented on each visit by a skilled dermatologist. 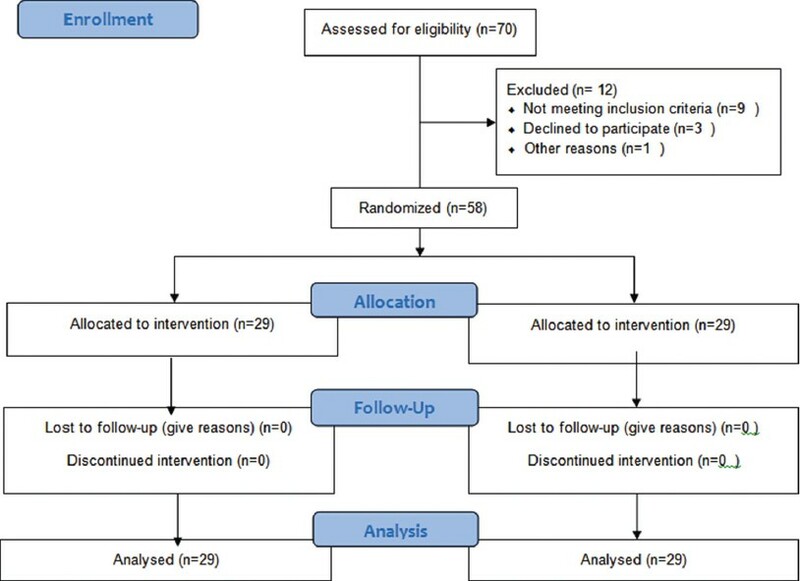 CONSORT flow chart of the study was showed in one diagram [Figure 1]. Statistical evaluation was done using SPSS® for Windows version 18.0 (SPSS Inc., II, USA). Data were shown as frequency (percentage) or mean ± standard deviation. The repeated-measures analysis (ANOVA) and the Chi-square test were used as the appropriate measures. P ≤ 0.001 was considered to be statistically significant. Fifty eight patients, 25 males (43.1%) and 33 females (56.9%), range: 18-25 years were enrolled in this study. The mean duration of acne in the study population was 3.19 ± 1.8 years (range: 2-5 years). The patients were divided into groups randomly: (group A: 5% dapsone gel and group B vehicle neutral gel); there were no significant differences between the two groups (P > 0.001). Demographic data and number of inflammatory, non-inflammatory facial lesions and GAAS are summarized in [Table 2] and compared between the two groups at baseline [Table 2]. All patients had normal of G6PD level. Finally, the two groups were compared with regard to baseline counts. Decrease in the mean inflammatory and non-inflammatory lesion counts was significantly more in group A compared to group B on all follow-up visits (P < 0.001) [Figure 2], Although reduction in GAAS was not significant on all follow-up visits (P = 0.264) [Table 3]. Our result showed that clinical efficacy (i.e. number of lesion) in topical dapsone plus oral isotretinoin group in female patients are significantly superior to the male ones after treatment at the end of the study (P < 0.001). The side-effects on the dapsone-treated group were a mild burning sensation in 7 patients (24.13%), mild erythema of the skin and mild dryness in 4 (13.79%) and 3 (10.34%) cases respectively (P < 0.001. 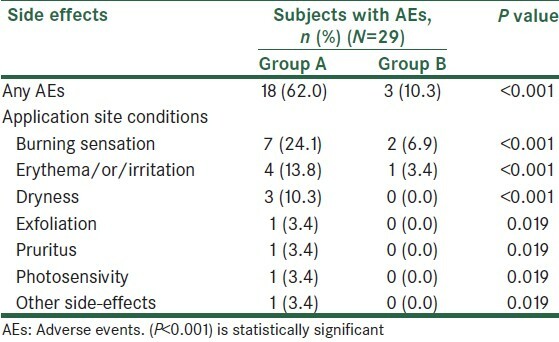 The side-effects are summarized and compared in the two groups on different occasions are shown in [Table 4]. One patient developed contact conjunctivitis due to application of dapsone too close to the eye. However, none of these side-effects led to discontinuation of treatment and all the participants completed the study. No clinically significant changes were made in laboratory parameters including hemoglobin (P = 0.345). The results suggest that anti-inflammatory agents such as dapsone can effectively reduce the count of lesions but do not alter the final outcome and The GAAS treat when used in combination with systemic isotretinoin. The limitations of our study were short duration of treatment and lack of more objective methods for result assessment. We are very grateful to Dr. Baghaeizadeh and Dr. Khosravani, for their help in performing this research. 1. Hsu P, Litman GI, Brodell RT. Overview of the treatment of acne vulgaris with topical retinoids. Postgrad Med 2011;123:153-61. 2. Kraft J, Freiman A. Management of acne. CMAJ 2011;183:E430-5. 3. Tanghetti EA. The role of inflammation in the pathology of acne. J Clin Aesthet Dermatol 2013;6:27-35. 4. Dhir R, Gehi NP, Agarwal R, More YE. Oral isotretinoin is as effective as a combination of oral isotretinoin and topical anti-acne agents in nodulocystic acne. Indian J Dermatol Venereol Leprol 2008;74:187. 5. Sago J, Hall RP. Dapsone. Dermatol Ther 2002;15:340-51. 6. Scheinfeld N. Aczone, a topical gel formulation of the antibacterial, anti-inflammatory dapsone for the treatment of acne. Curr Opin Investig Drugs 2009;10:474-81. 7. Paniker U, Levine N. Dapsone and sulfapyridine. Dermatol Clin 2001;19:79-86, viii. 8. Pickert A, Raimer S. An evaluation of dapsone gel 5% in the treatment of acne vulgaris. Expert Opin Pharmacother 2009;10:1515-21. 9. Schlessinger J, Menter A, Gold M, Leonardi C, Eichenfield L, Plott RT, et al. Clinical safety and efficacy studies of a novel formulation combining 1.2% clindamycin phosphate and 0.025% tretinoin for the treatment of acne vulgaris. J Drugs Dermatol 2007;6:607-15. 10. Tanghetti E, Harper JC, Oefelein MG. 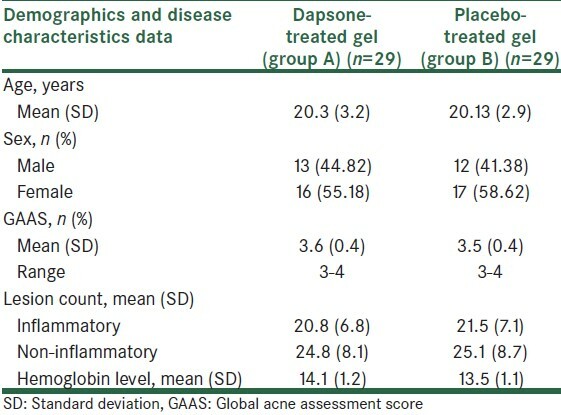 The efficacy and tolerability of dapsone 5% gel in female vs male patients with facial acne vulgaris: Gender as a clinically relevant outcome variable. J Drugs Dermatol 2012;11:1417-21. 11. Draelos ZD, Carter E, Maloney JM, Elewski B, Poulin Y, Lynde C, et al. Two randomized studies demonstrate the efficacy and safety of dapsone gel, 5% for the treatment of acne vulgaris. J Am Acad Dermatol 2007;56:439.e1-10. 12. Kircik LH. Harnessing the anti-inflammatory effects of topical dapsone for management of acne. J Drugs Dermatol 2010;9:667-71. 13. Booth SA, Moody CE, Dahl MV, Herron MJ, Nelson RD. Dapsone suppresses integrin-mediated neutrophil adherence function. J Invest Dermatol 1992;98:135-40. 14. Debol SM, Herron MJ, Nelson RD. Anti-inflammatory action of dapsone: Inhibition of neutrophil adherence is associated with inhibition of chemoattractant-induced signal transduction. J Leukoc Biol 1997;62:827-36.